Listen to this track by Stiff Records urchin and new wave scrapper Wreckless Eric. It’s ‘Whole Wide World’ as taken from his self-titled, 1978 LP Wreckless Eric. The song had previously been released as a single (twinned with ‘Semaphor Signals’), as produced by Stiff house producer Nick Lowe. This song is one of the results of a keen interest that Wreckless Eric (born Eric Goulden) had in pub rock, a scene that grew up alongside punk rock, and in fact pre-dated it. ‘Whole Wide World’ and the innocence it exudes was used to great effect in the film Stranger Than Fiction, when Will Farrell’s repressed IRS agent finally falls in love, getting the girl by singing this song to her. 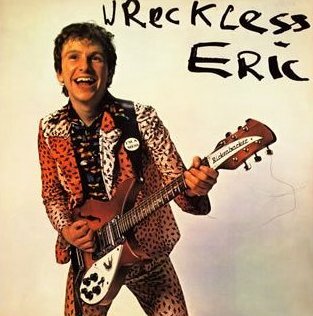 Wreckless Eric’s sound was looked upon as something of the runt in the Stiff Records litter, basic three-chord constructions that drew from 60s garage rock, girl groups, and early 70s glam poppers Slade. His music is idiosyncratic, and sometimes half-baked, making him something of an English Jonathan Richman. But, like Richman, Wreckless Eric got by on his ability to charm, even while demonstrating a sort of studied ineptitude when it comes to traditional pop subject matter. It’s arguable that Wreckless Eric was the most ‘punk’ of the Stiff stable, with a adenoidal whine of a voice matched with a muddy, bludgeoning stomp of a beat behind it. But with this song, you’re hearing something of a return to classic pop songwriting aimed at teenagers. This is a tried and true approach to rock ‘n’ roll songwriting, and has been from the beginning. There is something endearingly juvenile about this song, with some truly clunky lyrics and bare bones arrangement. To me, this tune is a look inside the mind of an early teen, a snapshot of a kid’s idea about romance. As such, this song does what the best rock ‘n’ roll songs do; it gives a voice to the awkward teen audience it’s aimed at. For all of Wreckless Eric’s wide-eyed innocence here on this song, it’s clear that his approach to songwriting betrayed the mark of experience, too. And with this tune, he captures a kernel of truth, which is another aspect to be found in the best of pop songwriting.